Firstly, let’s get the pun out of the way by hailing this album as a ‘slice of Americana heaven’. Mind you with the calibre of artists assembled, it was only really going to send MERCYLAND Volume 2 in one direction and full credit must be given to Phil Madeira for piloting such a project. If you are one of the many who may not be acquainted with Volume 1 there is no need to fear as the second instalment towers tall as a stand-alone entity. What is revealed when you access this record are twelve gorgeous tracks, magnificently packaged and presented in a way that invites universal praise. As the strapline, Hymns for the Rest of Us, suggests, this is a spiritual album that doesn’t set out to preach but is designed to celebrate the enormous impact that faith has in the world of country, roots and Americana music. For this reason, the record succeeds in reaching out across the divide giving folks the option to derive from it what they desire rather than being told. All but one of the twelve tracks contain a strong spiritual message with the odd one out being John Scofield’s instrumental ‘Heaven Hill’ which brings the record to its conclusion after an uplifting forty-five minutes. The line-up is packed full of leading names in contemporary Americana music with Emmylou Harris leading the way with a beautiful song titled ‘Kyrie’ and featuring ex-Civils Wars member John Paul White on accompanying vocals. Possibly making a claim for the elite track is the strategically placed opener ‘I Can’t See That Hand’ by The Lone Bellow with the enticing opening line ‘Let’s all go to heaven together’. This rousing start will get the heart pumping and the mind spinning with the desired effect of getting many opportunities to enthral when you set your mobile device or CD player to repeat play at the album’s conclusion. Of course the experience will be much more cultured and interactive when you have to flip the vinyl version over continuously between sides one and two. Regardless of your position on the atheist-agnostic-theist axis, any Americana music fan should appreciate the gospel influence in roots music and its intrinsic value, even if only from a lyrical and melodic tune quality angle. 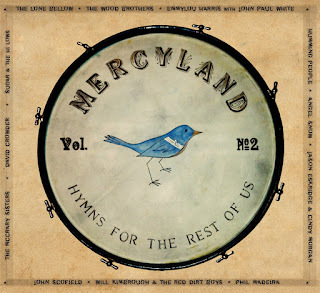 MERCYLAND will re-enforce this with further strains of rock, soul and tempting singer-songwriter fare. Angel Snow’s sumptuous contribution ‘I Said I Meant It’ is a solid roots effort with plenty of country twang, while that stalwart of the Nashville recording scene, Will Kimbrough serves up a thoughtful and sensitive number with the Red Dirt Boys in ‘Madness of the World’. Amy Stroup and Trent Dabbs have recently introduced their band Sugar and the Hi-Lows to UK audiences in the role of Kacey Musgraves support act and have had their track ‘Stranger’ included on the record. Leading the soulful contingent has to be the McCrary Sisters, another band recently active on the UK gig scene, doing what they do best with the gospel induced ‘Boom Chick a Boom’. This is closely followed by the excellent rock ‘n’ soul duet ‘Sacred Ground’ by Jason Eskridge and Cindy Morgan. While we’re talking about this inspirational foot tapping style, the inclusion of ‘Can’t Put a Name on It’ by The Wood Brothers in the number two slot ensures the record gets off to a rampant start before elegantly meandering in tone and mood. David Crowder’s ear pleasing ballad ‘Make an Ocean’ shines in the album’s latter stages and showcases the more measured side to the record. Whether or not all these names are familiar to listeners is immaterial as collectively they merge so effectively into a blissful serving of five star music. The track ‘Stars’ by Humming People is another worthy inclusion, which just leaves the offering by album architect Phil Madeira to consider. You won’t be surprised to read that his rough and rootsy effort ‘Mercy’ comes up trumps with plenty of fiddle driving a track as indicative of the release as any of the eleven predecessors included. MERCYLAND Vol 2 is a powerful compilation packed with strong messages and from a wider angle, succeeds in celebrating over preaching. Whether you approach your spiritual side of American music from Hank’s ‘I Saw the Light’ or Carrie Underwood’s ‘Jesus Take the Wheel’, this collection demands attention, respect and ultimately will deliver on a multitude of platforms. You may not be ready for Americana heaven yet, or ever, but the journey is worth living every minute in the company of this record. The Lone Bellow - "I See That Hand"
The Wood Brothers - "Can't Put A Name On It"
Emmylou Harris with John Paul White - "Kyrie"
Angel Snow - "I Said It, I Mean It"
Jason Eskridge & Cindy Morgan - "Sacred Ground"
Sugar & The Hi-Lows - "Stranger"
Will Kimbrough- "The Madness of the World"
David Crowder - "Make An Ocean"
John Schofield - "Heaven Hill"